David Walliam’s fans will be very excited to hear that yet another of his books has hit the library and book shop shelves – and so soon after The Ice Monster! Released in December last year, The Ice Monster is still on the kid’s bestseller list and has been ever since – a testament to the phenomenon that Walliams is in children’s books. After The World’s Worst Children series you may have quite rightly thought that Walliams would have reached the bottom of the creatively disturbing depths of his imagination. However, when it comes to dreaming up very badly-behaved children, he shows in his new book, Fing, that he has a gift. There is nothing more anxiety inducing to a parent than a child who is never satisfied and Myrtle Meek the hero (or anti-hero as it happens), is a child that always wants more, even when she isn’t sure exactly what that is! Mr and Mrs Meek are very shy librarians, the fact that they are married is in itself a miracle as it took them a year of working alongside one another to start a conversation. Imagine their alarm and surprise when their first beloved child is not in the least bit shy, but very forthcoming and upfront about exactly what it is she wants – and that happens to be more of everything. One day in a fit of rage Myrtle declares ‘I wanna Fing’ and as you would expect, the Meeks have absolutely no idea what a Fing is. They are at their wits end. How will they manage to get this elusive ‘Fing’ and keep their darling Myrtle happy? And so, they turn to the place they know best, the library and it is here in the ancient dark vaults of the library, in the pages of a very old and mysterious tome called the Monsterpedia that they discover that there really is such a thing as a Fing and where they might find one. That’s not the only problem that they discover! With this foreboding information the adventure begins for Mr and Mrs Meek, and as Myrtle has set a strict deadline, they have to hop to it! Will they manage to find a Fing and if they do, will they survive their encounter with it? And if they don’t, will they survive the wrath of Myrtle? In usual Walliam’s style Fing is a vibrant, exciting rollercoaster of a read accompanied by the wonderfully hilarious illustrations of Tony Ross. Your primary school reader will be in heaven and you’ll have a chuckle too – you also might find yourself thanking the universe that you don’t have a Myrtle at your house! 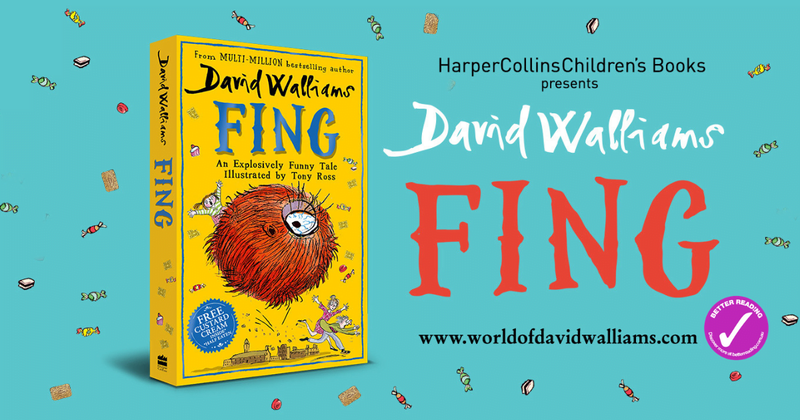 David Walliams – comedian, actor and author – continues to take the children’s literary world by storm. His tenth novel, BAD DAD, was an immediate number one, following the triumph of THE MIDNIGHT GANG, the biggest-selling children’s book of 2016. WORLD’S WORST CHILDREN 2, which published in early 2017, spent four weeks at industry number one and eight weeks at the top of the children’s chart. They have achieved unprecedented critical acclaim – and RATBURGER, DEMON DENTIST and AWFUL AUNTIE have all won the National Book Awards Children’s Book of the Year. 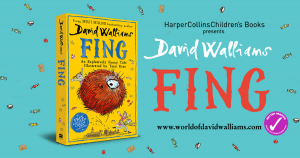 David’s books have now exceeded 100 non-consecutive weeks in the children’s number-one spot, and have been translated into 53 languages, selling more than 24 million copies worldwide.